The post below is verbatim the press release sent out by Sarah Tobias, the Associate Director of the Rutgers Institute for Research on Women. The Prison Creative Arts Project (PCAP) will have both a panel (featuring me, Janie Paul, and Reuben Kenyatta) and an exhibition at the conference. Additionally, all four of the PCAP staff–Graham Hamilton, Vanessa Mayesky, Shaka Senghor, and Heather Wilson–will be in attendance at the conference, as will Julia Taylor–a PCAP Associate (as we call our alumni) who will be speaking on a panel about the work she has done since leaving PCAP. The two pieces of art in this post were made by PCAP artists and are among those being used to advertise the conference. To see a range of some of the artwork being displayed at the conference, click here. For the full conference website, click here. Lutalo’s use of art to communicate is not an exception. 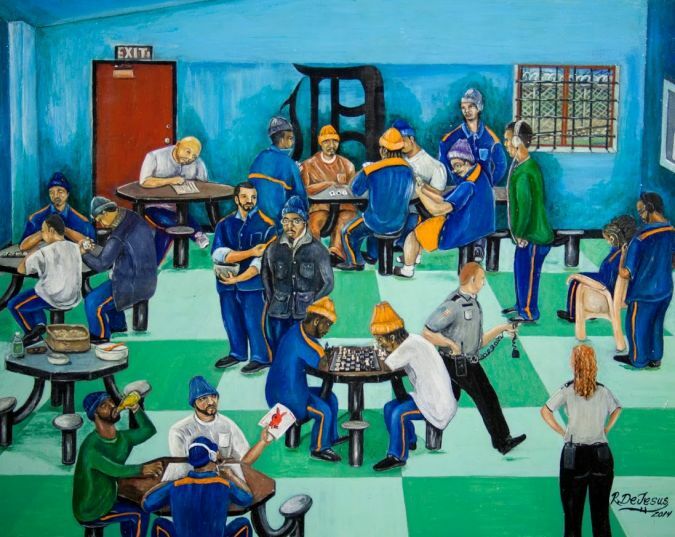 From photographs taken in visiting rooms to hand-etched illustrations in prisoner-written newsletters, art is an important vehicle for incarcerated people to convey their experiences. Lutalo is not be the only artist whose work is displayed as part of the multi-site exhibition, which can be viewed at Alfa Art Gallery, Rutgers Art Library, Eagleton Institute of Politics, Heldrich Hotel, New Brunswick Public Library, and the Zimmerli Art Museum at Rutgers for most of the month of October. Other contributing artists include Dean Gillespie, an artist exonerated through the work of the University of Cincinnati’s Innocence Project after serving 20 years in prison for crimes he did not commit. Gillespie creates miniaturia, and four of his pieces, including a model of a dinette created from cigarette wrappers, will be on display in the Rutgers Art Library. Jesse Krimes, another formerly incarcerated artist, is displaying his epic Apokaluptein: 16389067, a work created from smuggled prison bed-sheets and newspaper clippings, at the Zimmerli Museum at Rutgers-New Brunswick. The New Brunswick Public Library will show photography by Ron Levine, whose work focuses on a rapidly increasing demographic group among prison populations – the elderly and aging – as well as a selection fromFamily Crisis Services’ More Than a Rap Sheet: The Real Stories of Incarcerated Women, featuring photographs of incarcerated women in Maine, accompanied by their poetry. Alfa Art Gallery will host Prison Obscura, presenting rarely seen photography created by prisoners, the Heldrich Hotel will show the abstract paintings of formerly incarcerated artists Jaso Nomo and Gilberto Rivera, and artist Mark Strandquist will install his public art project Windows from Prison on the Eagleton Lawn at Rutgers as part of the program. In addition to art on display at six locations across Rutgers campus and the City of New Brunswick, the program will include two days of film screenings in the Ruth Dill Johnson Crockett Conference Room (162 Ryders Lane, New Brunswick, NJ). 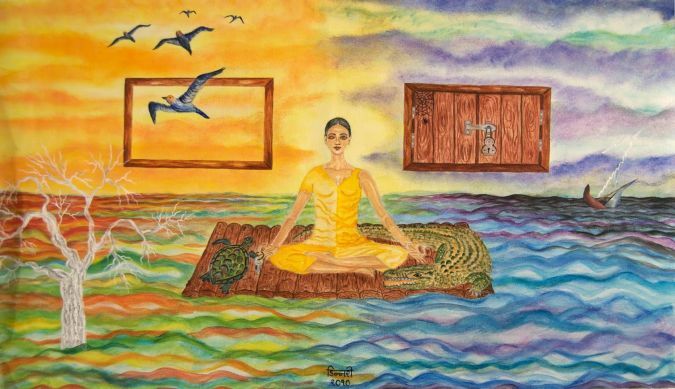 “Art serves as an expressive tool, a means of political protest, and a creative survival strategy for many who are incarcerated,” said Dr. Nicole R. Fleetwood, the conference lead organizer who is writing a book about art made in prisons. “It also helps to challenge the dehumanization of the incarcerated. There is a huge gap between the dominant public perception of prisoners as lacking in value and their humanity and productivity. Prisoners are individuals who dream and envision brighter futures and who are cherished by families on the outside.” The conference accompanying the art exhibit includes three days of panels, workshops, lectures, poetry readings, performances, films, and presentations by artists, activists, scholars, and community groups. Reginald Dwayne Betts, poet and author of A Questions of Freedom: A Memoir of Learning, Survival, and Coming of Age in Prison and Shahid Reads His Own Palm, will give the keynote address. The conference and exhibitions are free and open to the public. Please see the attached calendar for the Marking Timeconference and exhibitions schedule. For more information, visit irw.rutgers.edu or email the Institute for Research on Women at irw@rci.rutgers.edu. This program is made possible in part by a grant from the New Jersey Council for the Humanities, a state partner of the National Endowment for the Humanities. Any views, findings, conclusions or recommendations in this program do not necessarily represent those of the National Endowment for the Humanities or the New Jersey Council for the Humanities. This program is also made possible by the generous support of the Puffin Foundation Ltd. Prison Obscura is a traveling exhibition curated by Pete Brook and made possible with the support of the John B. Hurford ’60 Center for the Arts and Humanities and Cantor Fitzgerald Gallery at Haverford College, Haverford, PA.Organized by the Institute for Research on Women, the conference and multi-site exhibition co-sponsors include: Alfa Art Gallery; American Friends Service Committee’s Prison Watch Program; Art Library-Rutgers New Brunswick; Associate Campus Dean of Douglass Residential College; Center for Social Justice Education and LGBT Communities; Department of American Studies, Rutgers-New Brunswick; Heldrich Hotel; Department of History, Rutgers-New Brunswick; Institute for Women and Art, Mountainview Program; New Brunswick Public Library; Office of the Chancellor of Rutgers-New Brunswick; Office of the Executive Dean of the School of Arts and Sciences, Rutgers-New Brunswick; Prison Creative Arts Project at the University of Michigan; PUEG Center at UNAM (National University of Mexico); Rutgers-Camden Center for the Arts; School of Criminal Justice at Rutgers-Newark; William James Association; Zimmerli Art Museum at Rutgers-New Brunswick.